The California Genealogical Society has been publishing this blog for five years! The blog was created for and about the members of the society. I offer my annual "thank-you" to the members who have contributed photographs, articles, and their stories. In addition, this year I would like to highlight some special friends who I first "met" virtually but who have become great "real-life" friends as well. They have all since become members and supporters of the California Genealogical Society. Thank you, Craig, Sheri, Cheryl, Thomas, Amy, Elizabeth, Kim, and Denise! Links to all of their blogs can also be found in the right sidebar of this blog under "CGS Member Blogs" with those of other blogs written by members of the society. For a long time this blog roll was a lonely place, but as you can see, many members are blogging. Thank you all, for the time and effort you expend to share your genealogy. If I have missed your blog and you are a CGS member, please leave a comment so I can add yours to the list. 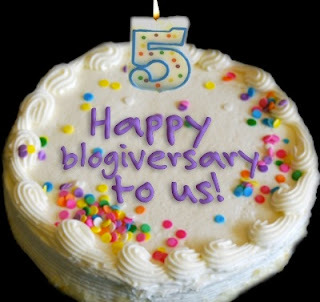 HAPPY BLOGOVERSARY TO YOU, HAPPY BLOGOVERSARY TO YOU,HAPPY 5th BLOGOVERSARY DEAR DAHLING KATHRRRRRRRYNNNNNN ,HAPPY BLOGOVERSARY TO YOUUUUUUU!!!! !